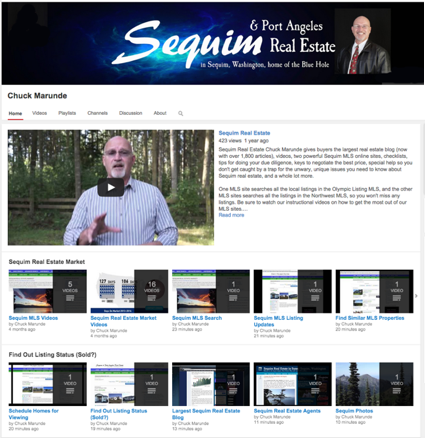 Did you know there are Sequim real estate videos on a Youtube channel specifically for buyers? We have so many free online resources, most buyers don’t find them all. We have many Sequim real estate videos on this blog, but with over 1,800 articles, buyers don’t find everything they need the first time they visit this site. These videos will help you search for your home with the best MLS sites, and it will show you how to get all the information you need about Sequim and moving to Sequim and buying a home. Check out some of these videos. We think you will be pleasantly surprised. We have a whole series of videos on how to search for your perfect retirement home with the right parameters, how to filter through the listings intelligently, how to save your favorites so you will have a short list of homes to look at when you get here, and we show you tricks to find out if a listing is already pending or sold. We have the number of days each listing has been on the market and much more. Many public MLS sites do not show you all this information. Just click on the image above or to to Sequim Real Estate Videos. You’ll also find out about some other tools we give away. We publish books specifically for buyers moving to Sequim, and these are full 300 page paperback books. No one creates so much for buyers. Maybe we’re crazy, but we love our buyers, and we will keep on giving until . . . we meet you. Meanwhile, enjoy these Sequim real estate videos. What is the price per square foot to build your home in Port Angeles or Sequim?